​​​​​​​At No. 88 Walmgate, our restaurant in York, we offer a tasty selection of dishes, ideal for sharing with friends or family. Every dish comes served with a dash of warm Yorkshire hospitality from our friendly staff. Our focus is simple: a cracking selection of dishes, made using fresh local ingredients with an internationally inspired twist, served up with a selection of craft beers and ales, from Yorkshire and beyond. 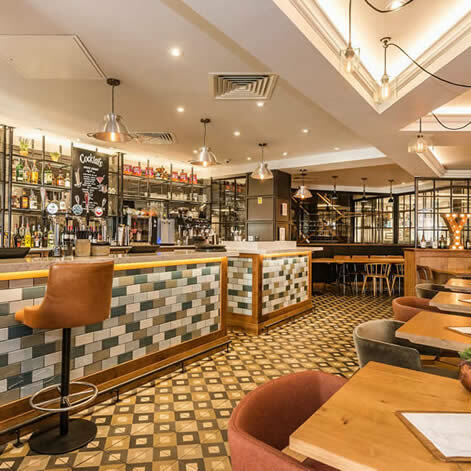 Tuck into your choice of fish, meat or veggie small plates, from a Halloumi Burger to Curried Smoked Haddock Risotto or try your hat at our '88, Mixed Grill'! There’s something on the menu to satisfy any craving, all made using quality, seasonal ingredients from local suppliers. Open 12 noon - 10pm. CALL 01904 231 333 TO BOOK A TABLE, OR EMAIL US HERE! Here at No.88 Walmgate, everybody’s favourites are on the menu. Tuck into our delicious Cajun chicken and Harrogate Blue burger or tasty Herb Gnocchi, two of our favourite plates. Fish lovers can delve into our popular 88 Walmgate Fish and Chips. If you simply can’t decide, pick and mix from our variety of starters including smoked fish cakes, a house pate with Haxby Bakehouse Sourdough or our Charcuterie Board to share! Puddings are a must at our restaurant in York. Choices include Apple Crumble, Honeycomb Cheesecake, 88 chocolate brownie or a delicious selection of Yorkshire Cheese. Lovely room with an excellent bathroom and a very well stocked bar! Looking forward to staying here again.